This article is about the fruit. For other uses, see Mango (disambiguation). The mango is a juicy stone fruit (drupe) belonging to the genus Mangifera, consisting of numerous tropical fruiting trees, cultivated mostly for edible fruit. The majority of these species are found in nature as wild mangoes. They all belong to the flowering plant family Anacardiaceae. The mango is native to South Asia, from where it has been distributed worldwide to become one of the most cultivated fruits in the tropics. While other Mangifera species (e.g. horse mango, Mangifera foetida) are also grown on a more localized basis, Mangifera indica—the "common mango" or "Indian mango"—is the only mango tree commonly cultivated in many tropical and subtropical regions. 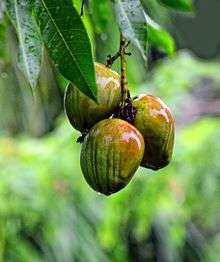 It is the national fruit of India, Pakistan, and the Philippines, and the national tree of Bangladesh. Mango trees grow up to 35–40 m (115–131 ft) tall, with a crown radius of 10 m (33 ft). The trees are long-lived, as some specimens still fruit after 300 years. In deep soil, the taproot descends to a depth of 6 m (20 ft), with profuse, wide-spreading feeder roots; the tree also sends down many anchor roots, which penetrate several feet of soil. The leaves are evergreen, alternate, simple, 15–35 cm (5.9–13.8 in) long, and 6–16 cm (2.4–6.3 in) broad; when the leaves are young they are orange-pink, rapidly changing to a dark, glossy red, then dark green as they mature. The flowers are produced in terminal panicles 10–40 cm (3.9–15.7 in) long; each flower is small and white with five petals 5–10 mm (0.20–0.39 in) long, with a mild, sweet odor suggestive of lily of the valley. Over 400 varieties of mangoes are known, many of which ripen in summer, while some give double crop. The fruit takes three to six months to ripen. The ripe fruit varies in size and color. Cultivars are variously yellow, orange, red, or green, and carry a single flat, oblong pit that can be fibrous or hairy on the surface, and which does not separate easily from the pulp. Ripe, unpeeled mangoes give off a distinctive resinous, sweet smell. Inside the pit 1–2 mm (0.039–0.079 in) thick is a thin lining covering a single seed, 4–7 cm (1.6–2.8 in) long. The seed contains the plant embryo. Mangoes have recalcitrant seeds; they do not survive freezing and drying. The mango illustrated by Michael Boym in the 1656 book Flora Sinensis. The English word "mango" (plural "mangoes" or "mangos") originated from the Malayalam word māṅṅa via Portuguese (also manga) during spice trade with Kerala in 1498. The word's first recorded attestation in a European language was a text by Ludovico di Varthema in Italian in 1510, as manga; the first recorded occurrences in languages such as French and postclassical Latin appear to be translations from this Italian text. The origin of the "-o" ending in English is unclear. Mango is also mentioned by Hendrik van Rheede, the Dutch commander of Malabar (Northern Kerala) in his book Hortus Malabaricus, a compendium of the plants of economic and medical value in the Malabar, published in 1678. When mangoes were first imported to the American colonies in the 17th century, they had to be pickled because of lack of refrigeration. Other fruits were also pickled and came to be called "mangoes", especially bell peppers, and by the 18th century, the word "mango" became a verb meaning "to pickle". In Mandarin Chinese, mango is "芒果", or "mángguǒ" in Pinyin. This is most likely a loanword from English. Mangoes have been cultivated in South Asia for thousands of years and reached Southeast Asia between the fifth and fourth centuries BCE. By the 10th century CE, cultivation had begun in East Africa. The 14th-century Moroccan traveler Ibn Battuta reported it at Mogadishu. Cultivation came later to Brazil, Bermuda, the West Indies, and Mexico, where an appropriate climate allows its growth. The mango is now cultivated in most frost-free tropical and warmer subtropical climates; almost half of the world's mangoes are cultivated in India alone, with the second-largest source being China. Mangoes are also grown in Andalusia, Spain (mainly in Málaga province), as its coastal subtropical climate is one of the few places in mainland Europe that permits the growth of tropical plants and fruit trees. The Canary Islands are another notable Spanish producer of the fruit. 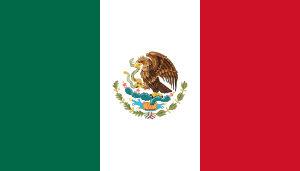 Other cultivators include North America (in South Florida and California's Coachella Valley), South and Central America, the Caribbean, Hawai'i, south, west, and central Africa, Australia, China, South Korea, Pakistan, Bangladesh, and Southeast Asia. Though India is the largest producer of mangoes, it accounts for less than 1% of the international mango trade; India consumes most of its own production. Many commercial cultivars are grafted on to the cold-hardy rootstock of Gomera-1 mango cultivar, originally from Cuba. Its root system is well adapted to a coastal Mediterranean climate. Many of the 1,000+ mango cultivars are easily cultivated using grafted saplings, ranging from the "turpentine mango" (named for its strong taste of turpentine) to the huevos de toro. Dwarf or semidwarf varieties serve as ornamental plants and can be grown in containers. A wide variety of diseases can afflict mangoes. There are many hundreds of named mango cultivars. In mango orchards, several cultivars are often grown in order to improve pollination. Many desired cultivars are monoembryonic and must be propagated by grafting or they do not breed true. A common monoembryonic cultivar is 'Alphonso', an important export product, considered as "the king of mangoes". Cultivars that excel in one climate may fail elsewhere. For example, Indian cultivars such as 'Julie', a prolific cultivar in Jamaica, require annual fungicide treatments to escape the lethal fungal disease anthracnose in Florida. Asian mangoes are resistant to anthracnose. The current world market is dominated by the cultivar 'Tommy Atkins', a seedling of 'Haden' that first fruited in 1940 in southern Florida and was initially rejected commercially by Florida researchers. Growers and importers worldwide have embraced the cultivar for its excellent productivity and disease resistance, shelf life, transportability, size, and appealing color. Although the Tommy Atkins cultivar is commercially successful, other cultivars may be preferred by consumers for eating pleasure, such as Alphonso. Generally, ripe mangoes have an orange-yellow or reddish peel and are juicy for eating, while exported fruit are often picked while underripe with green peels. Although producing ethylene while ripening, unripened exported mangoes do not have the same juiciness or flavor as fresh fruit. 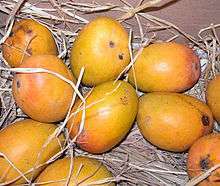 Like other drupaceous fruits, mangoes occur in both freestone and clingstone varieties. In 2013, world production of mangoes (data including mangosteens and guavas) was nearly 43 million tonnes, with India accounting for 42% (18 million tonnes) of the total (table). China and Thailand were the next largest producers (table). Mangoes are generally sweet, although the taste and texture of the flesh varies across cultivars; some have a soft, pulpy texture similar to an overripe plum, while others are firmer, like a cantaloupe or avocado, and some may have a fibrous texture. The skin of unripe, pickled, or cooked mango can be consumed, but has the potential to cause contact dermatitis of the lips, gingiva, or tongue in susceptible people. Mangoes are widely used in cuisine. Sour, unripe mangoes are used in chutneys, athanu, pickles, side dishes, or may be eaten raw with salt, chili, or soy sauce. A summer drink called aam panna comes from mangoes. Mango pulp made into jelly or cooked with red gram dhal and green chillies may be served with cooked rice. Mango lassi is popular throughout South Asia, prepared by mixing ripe mangoes or mango pulp with buttermilk and sugar. Ripe mangoes are also used to make curries. Aamras is a popular thick juice made of mangoes with sugar or milk, and is consumed with chapatis or pooris. The pulp from ripe mangoes is also used to make jam called mangada. Andhra aavakaaya is a pickle made from raw, unripe, pulpy, and sour mango, mixed with chili powder, fenugreek seeds, mustard powder, salt, and groundnut oil. Mango is also used in Andhra to make dahl preparations. Gujaratis use mango to make chunda (a spicy, grated mango delicacy). Mangoes are used to make murabba (fruit preserves), muramba (a sweet, grated mango delicacy), amchur (dried and powdered unripe mango), and pickles, including a spicy mustard-oil pickle and alcohol. 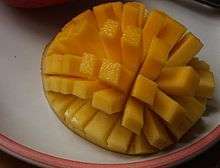 Ripe mangoes are often cut into thin layers, desiccated, folded, and then cut. These bars are similar to dried guava fruit bars available in some countries. The fruit is also added to cereal products such as muesli and oat granola. Mangoes are often prepared charred in Hawaii. Unripe mango may be eaten with bagoong (especially in the Philippines), fish sauce, vinegar, soy sauce, or with dash of salt (plain or spicy). Dried strips of sweet, ripe mango (sometimes combined with seedless tamarind to form mangorind) are also popular. Mangoes may be used to make juices, mango nectar, and as a flavoring and major ingredient in ice cream and sorbetes. Mango is used to make juices, smoothies, ice cream, fruit bars, raspados, aguas frescas, pies, and sweet chili sauce, or mixed with chamoy, a sweet and spicy chili paste. It is popular on a stick dipped in hot chili powder and salt or as a main ingredient in fresh fruit combinations. In Central America, mango is either eaten green mixed with salt, vinegar, black pepper, and hot sauce, or ripe in various forms. Toasted and ground pumpkin seed (pepita) with lime and salt are eaten with green mangoes. Pieces of mango can be mashed and used as a topping on ice cream or blended with milk and ice as milkshakes. Sweet glutinous rice is flavored with coconut, then served with sliced mango as a dessert. In other parts of Southeast Asia, mangoes are pickled with fish sauce and rice vinegar. Green mangoes can be used in mango salad with fish sauce and dried shrimp. Mango with condensed milk may be used as a topping for shaved ice. The energy value per 100 g (3.5 oz) serving of the common mango is 250 kJ (60 kcal), and that of the apple mango is slightly higher (330 kJ (79 kcal) per 100 g). Fresh mango contains a variety of nutrients (right table), but only vitamin C and folate are in significant amounts of the Daily Value as 44% and 11%, respectively. Numerous phytochemicals are present in mango peel and pulp, such as the triterpene, lupeol which is under basic research for its potential biological effects. An extract of mango branch bark called Vimang, containing numerous polyphenols, has been studied in elderly humans. Mango peel pigments under study include carotenoids, such as the provitamin A compound, beta-carotene, lutein and alpha-carotene, and polyphenols, such as quercetin, kaempferol, gallic acid, caffeic acid, catechins and tannins. Mango contains a unique xanthonoid called mangiferin. Phytochemical and nutrient content appears to vary across mango cultivars. Up to 25 different carotenoids have been isolated from mango pulp, the densest of which was beta-carotene, which accounts for the yellow-orange pigmentation of most mango cultivars. Mango leaves also have significant polyphenol content, including xanthonoids, mangiferin and gallic acid. The pigment euxanthin, known as Indian yellow, is often thought to be produced from the urine of cattle fed mango leaves; the practice is described as having been outlawed in 1908 because of malnutrition of the cattle and possible urushiol poisoning. This supposed origin of euxanthin appears to rely on a single, anecdotal source, and Indian legal records do not outlaw such a practice. The flavor of mango fruits is constituted by several volatile organic chemicals mainly belonging to terpene, furanone, lactone, and ester classes. Different varieties or cultivars of mangoes can have flavor made up of different volatile chemicals or same volatile chemicals in different quantities. In general, New World mango cultivars are characterized by the dominance of δ-3-carene, a monoterpene flavorant; whereas, high concentration of other monoterpenes such as (Z)-ocimene and myrcene, as well as the presence of lactones and furanones, is the unique feature of Old World cultivars. In India, 'Alphonso' is one of the most popular cultivars. In 'Alphonso' mango, the lactones and furanones are synthesized during ripening; whereas terpenes and the other flavorants are present in both the developing (immature) and ripening fruits. Ethylene, a ripening-related hormone well known to be involved in ripening of mango fruits, causes changes in the flavor composition of mango fruits upon exogenous application, as well. In contrast to the huge amount of information available on the chemical composition of mango flavor, the biosynthesis of these chemicals has not been studied in depth; only a handful of genes encoding the enzymes of flavor biosynthetic pathways have been characterized to date. Contact with oils in mango leaves, stems, sap, and skin can cause dermatitis and anaphylaxis in susceptible individuals. Those with a history of contact dermatitis induced by urushiol (an allergen found in poison ivy, poison oak, or poison sumac) may be most at risk for mango contact dermatitis. Cross-reactions may occur between mango allergens and urushiol. During the primary ripening season of mangoes, contact with mango plant parts is the most common cause of plant dermatitis in Hawaii. However, sensitized individuals are still able to safely eat peeled mangos or drink mango juice. The mango is the national fruit of India, Pakistan, and the Philippines. 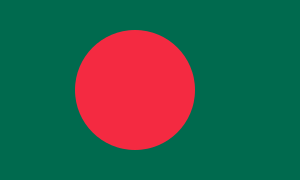 It is also the national tree of Bangladesh. 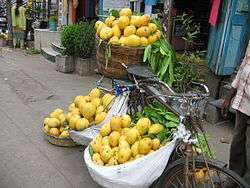 In India, harvest and sale of mangoes is during March–May and this is annually covered by news agencies. The Mughal emperor Akbar (1556–1605 CE) is said to have planted a mango orchard having 100,000 trees in Darbhanga, eastern India. 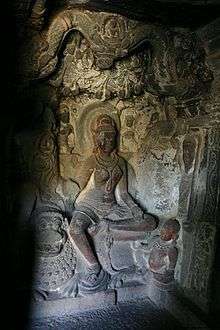 The Jain goddess Ambika is traditionally represented as sitting under a mango tree. In Hinduism, the perfectly ripe mango is often held by Lord Ganesha as a symbol of attainment, regarding the devotees' potential perfection. Mango blossoms are also used in the worship of the goddess Saraswati. No Telugu/Kannada New Year's Day called Ugadi passes without eating ugadi pachadi made with mango pieces as one of the ingredients. Dried mango skin and its seeds are also used in Ayurvedic medicines. Mango leaves are used to decorate archways and doors in Indian houses and during weddings and celebrations such as Ganesh Chaturthi. Mango motifs and paisleys are widely used in different Indian embroidery styles, and are found in Kashmiri shawls, Kanchipuram silk sarees, etc. Paisleys are also common to Iranian art, because of its pre-Islamic Zoroastrian past. In Tamil Nadu, the mango is referred to as one of the three royal fruits, along with banana and jackfruit, for their sweetness and flavor. This triad of fruits is referred to as ma-pala-vazhai. Fruit drinks that include mango are popular in India, with brands such as Frooti, Maaza, and Slice. These leading brands include sugar and artificial flavors, so they do not qualify as "juice" under Food Safety and Standards Authority of India regulations. In the West Indies, the expression "to go mango walk" means to steal another person's mango fruits. This is celebrated in the famous song, "The Mango Walk". In Australia, the first tray of mangoes of the season is traditionally sold at an auction for charity. The classical Sanskrit poet Kālidāsa sang the praises of mangoes. 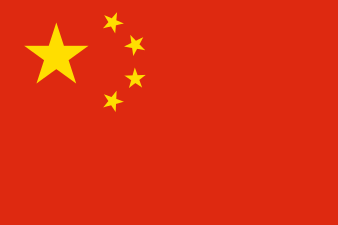 Mangoes, although they were almost unheard of in China before, were popularized during the Cultural Revolution as symbols of Chairman Mao Zedong's love for the people. ↑ Morton J (1987). "Mango". Fruits of warm climates. NewCROP, New Crop Resource Online Program, Center for New Crops & Plant Products, Purdue University. pp. 221–239. ↑ Kostermans AJHG, Bompard JM (1993). The Mangoes: Their Botany, Nomenclature, Horticulture and Utilization. Academic Press. ISBN 9780124219205. ↑ "Mango tree, national tree". 15 November 2010. Retrieved 16 November 2013. ↑ "Mango". California Rare Fruit Growers. Retrieved 4 November 2015. ↑ "Mango (Mangifera indica) varieties". toptropicals.com. Retrieved 2 January 2014. ↑ Marcos-Filho, Julio. "Physiology of Recalcitrant Seeds" (PDF). Ohio State University. Retrieved 3 December 2014. ↑ Mango Merriam Webster Dictionary. "Origin of mango: Portuguese manga, probably from Malayalam māṅga. First Known Use: 1582"
↑ "Definition for mango - Oxford Dictionaries Online (World English)". Oxforddictionaries.com. Retrieved 17 June 2012. ↑ "Hendrik Adriaan Van Reed Tot Drakestein 1636-1691 and Hortus, Malabaricus". google.co.in. Retrieved 4 November 2015. ↑ Creed, Richard (5 September 2010). "Relative Obscurity: Variations of antigodlin grow". Winston-Salem Journal (Opinion). Retrieved 6 September 2010. One plausible explanation of the usage [calling a green pepper a mango] is this: Mangos (the real thing) that were imported into the American colonies were from the East Indies. Transport was slow. Refrigeration was not available, so the mangos were pickled for shipment. Because of that, people began referring to any pickled vegetable or fruit as a mango ... bell peppers stuffed with spiced cabbage and pickled ... became so popular that bell peppers, pickled or not, became known as mangos. In the early 18th century, mango became a verb meaning to pickle. ↑ Watson, Andrew J. (1983). Agricultural innovation in the early Islamic world: the diffusion of crops and farming techniques, 700–1100. Cambridge, UK: Cambridge University Press. pp. 72–3. ISBN 0-521-24711-X. ↑ Jedele, S.; Hau, A.M.; von Oppen, M. "An analysis of the world market for mangoes and its importance for developing countries. Conference on International Agricultural Research for Development, 2003" (PDF). ↑ "India world's largest producer of mangoes, Rediff India Abroad, April 21, 2004". Rediff.com. 31 December 2004. Retrieved 31 January 2013. ↑ "Mad About mangoes: As exports to the U.S. resume, a juicy business opportunity ripens, India Knowledge@Wharton Network, June 14, 2007". Knowledge.wharton.upenn.edu. 14 June 2007. Retrieved 31 January 2013. ↑ "USAID helps Indian mango farmers access new markets". USAID-India. May 3, 2006. Archived from the original on 1 June 2006. ↑ Archived 11 November 2011 at the Wayback Machine. ↑ "USAID Helps Indian Mango Farmers Access New Markets". Archived from the original on 1 June 2006. ↑ "actahort.org". actahort.org. Retrieved 31 January 2013. 1 2 3 Jonathan Allen (10 May 2006). "Mango Mania in India". The New York Times. Retrieved 4 September 2013. ↑ Susser, Allen (2001). The Great Mango Book. New York: Ten Speed Press. ISBN 1-58008-204-1. 1 2 Mintz C (24 May 2008). "Sweet news: Ataulfos are in season". Toronto Star Online. Retrieved 1 August 2015. ↑ "Production/crops of mangoes including mangosteens and guavas for 2013". United Nations Food and Agriculture Organization, Statistics Division. 2013. Retrieved 20 March 2016. 1 2 D.Devika Bal (8 May 1995). "Mango's wide influence in Indian culture". New Strait Times. Retrieved 4 September 2013. ↑ "Vah Chef talking about Mango Lassi's popularity and showing how to make the drink". Vahrehvah.com. ↑ "Nutrient profile for mango from USDA SR-21". Nutritiondata.com. Retrieved 31 January 2013. ↑ "USDA National Nutrient Database for Standard Reference, SR-28, Full Report (All Nutrients): 09176, Mangos, raw". National Agricultural Library. USDA. Retrieved 25 January 2016. ↑ Chaturvedi PK, Bhui K, Shukla Y (2008). "Lupeol: connotations for chemoprevention". Cancer Lett. 263 (1): 1–13. doi:10.1016/j.canlet.2008.01.047. PMID 18359153. ↑ Rodeiro I, Cancino L, González JE, et al. (2006). "Evaluation of the genotoxic potential of Mangifera indica L. extract (Vimang), a new natural product with antioxidant activity". Food Chem Toxicol. 44 (10): 1707–13. doi:10.1016/j.fct.2006.05.009. PMID 16857303. ↑ Pardo-Andreu GL, Philip SJ, Riaño A, et al. (2006). "Mangifera indica L. (Vimang) protection against serum oxidative stress in elderly humans". Arch Med Res. 37 (1): 158–64. doi:10.1016/j.arcmed.2005.04.017. PMID 16314203. ↑ Berardini N, Fezer R, Conrad J, Beifuss U, Carle R, Schieber A (2005). "Screening of mango (Mangifera indica L.) cultivars for their contents of flavonol O – and xanthone C-glycosides, anthocyanins, and pectin". J Agric Food Chem. 53 (5): 1563–70. doi:10.1021/jf0484069. PMID 15740041. ↑ Gouado I, Schweigert FJ, Ejoh RA, Tchouanguep MF, Camp JV (2007). "Systemic levels of carotenoids from mangoes and papaya consumed in three forms (juice, fresh and dry slice)". Eur J Clin Nutr. 61 (10): 1180–8. doi:10.1038/sj.ejcn.1602841. PMID 17637601. ↑ Mahattanatawee K, Manthey JA, Luzio G, Talcott ST, Goodner K, Baldwin EA (2006). "Total antioxidant activity and fiber content of select Florida-grown tropical fruits". J Agric Food Chem. 54 (19): 7355–63. doi:10.1021/jf060566s. PMID 16968105. ↑ Singh UP, Singh DP, Singh M, et al. (2004). "Characterization of phenolic compounds in some Indian mango cultivars". Int J Food Sci Nutr. 55 (2): 163–9. doi:10.1080/09637480410001666441. PMID 14985189. ↑ Andreu GL, Delgado R, Velho JA, Curti C, Vercesi AE (2005). "Mangiferin, a natural occurring glucosyl xanthone, increases susceptibility of rat liver mitochondria to calcium-induced permeability transition". Arch Biochem Biophys. 439 (2): 184–93. doi:10.1016/j.abb.2005.05.015. PMID 15979560. ↑ Rocha Ribeiro SM, Queiroz JH, Lopes Ribeiro de Queiroz ME, Campos FM, Pinheiro Sant'ana HM (2007). "Antioxidant in mango (Mangifera indica L.) pulp". Plant Foods Hum Nutr. 62 (1): 13–7. doi:10.1007/s11130-006-0035-3. PMID 17243011. ↑ Chen JP, Tai CY, Chen BH (2004). "Improved liquid chromatographic method for determination of carotenoids in Taiwanese mango (Mangifera indica L.)". J Chromatogr A. 1054 (1–2): 261–8. PMID 15553152. ↑ Barreto JC, Trevisan MT, Hull WE, et al. (2008). "Characterization and quantitation of polyphenolic compounds in bark, kernel, leaves, and peel of mango (Mangifera indica L.)". J Agric Food Chem. 56 (14): 5599–610. doi:10.1021/jf800738r. PMID 18558692. ↑ Source: Kühn. "History of Indian yellow, Pigments Through the Ages". Webexhibits.org. Retrieved 31 January 2013. ↑ Finlay, Victoria (2003). Color: A Natural History of the Palette. New York: Random House Trade Paperbacks. ISBN 0-8129-7142-6. ↑ Macleod AJ, Pieris NM, 1984. Comparison of the volatile components of some mango cultivars. 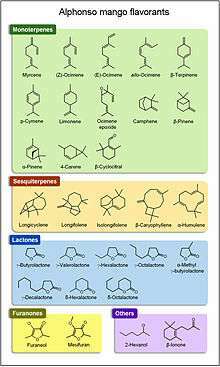 Phytochemistry 23, 361-366. 1 2 Pandit SS, Chidley HG, Kulkarni RS, Pujari KH, Giri AP, Gupta VS, 2009, Cultivar relationships in mango based on fruit volatile profiles, Food Chemistry, 144, 363–372. ↑ Narain N, Bora PS, Narain R and Shaw PE (1998). Mango, In: Tropical and Subtropical Fruits, Edt. by Shaw PE, Chan HT and Nagy S. Agscience, Auburndale, FL, USA, pp. 1-77. ↑ Kulkarni RS, Chidley HG, Pujari KH, Giri AP and Gupta VS, 2012, Flavor of mango: A pleasant but complex blend of compounds, In Mango Vol. 1: Production and Processing Technology (Eds. Sudha G Valavi, K Rajmohan, JN Govil, KV Peter and George Thottappilly) Studium Press LLC. 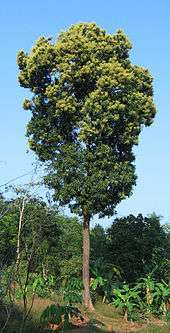 ↑ Pandit SS, Kulkarni RS, Chidley HG, Giri AP, Köllner TG, Degenhardt J, Gershenzon J, Gupta VS, 2009, Changes in volatile composition during fruit development and ripening of ‘Alphonso’ mango. Journal of Science of Food and Agriculture, 89, 2071–2081. ↑ Idstein, H., Schreier, P., 1985. Volatile constituents of Alphonso mango (Mangifera indica). Phytochemistry 24, 2313-2316. ↑ Kulkarni RS, Chidley HG, Pujari KH, Giri AP and Gupta VS, 2012, Geographic variation in the flavour volatiles of Alphonso mango. Food Chemistry, 130, 58–66. ↑ Lalel HJD, Singh Z, Tan S, 2003, The role of ethylene in mango fruit aroma volatiles biosynthesis, Journal of Horticultural Science and Biotechnology, 78, 485-496. ↑ Chidley HG, Kulkarni RS, Pujari KH, Giri AP and Gupta VS, 2013, Spatial and temporal changes in the volatile profile of Alphonso mango upon exogenous ethylene treatment. Food Chemistry, 136, 585-594. ↑ Pandit SS, Kulkarni RS, Giri AP, Köllner TG, Degenhardt J, Gershenzon J, Gupta VS, 2010, Expression profiling of various genes during the development and ripening of Alphonso mango, Plant Physiology and Biochemistry, 48, 426–433. ↑ Singh RK, Sane VA, Misra A, Ali SA, Nath P, 2010, Differential expression of the mango alcohol dehydrogenase gene family during ripening , Phytochemistry , 71, 1485–1494. ↑ Kulkarni RS, Pandit SS, Chidley HG, Nagel R, Schmidt A, Gershenzon J, Pujari KH, Giri AP and Gupta VS, 2013, Characterization of three novel isoprenyl diphosphate synthases from the terpenoid rich mango fruit. Plant Physiology and Biochemistry, 71, 121–131. ↑ Kulkarni RS, Chidley HG, Deshpande A, Schmidt A, Pujari KH, Giri AP and Gershenzon J, Gupta VS, 2013, An oxidoreductase from ‘Alphonso’ mango catalyzing biosynthesis of furaneol and reduction of reactive carbonyls, SpringerPlus, 2, 494. ↑ Miell J, Papouchado M, Marshall A (1988). "Anaphylactic reaction after eating a mango". British Medical Journal. 297 (6664): 1639–40. doi:10.1136/bmj.297.6664.1639. PMC 1838873 . PMID 3147776. ↑ Hershko K, Weinberg I, Ingber A (2005). "Exploring the mango – poison ivy connection: the riddle of discriminative plant dermatitis". Contact Dermatitis. 52 (1): 3–5. doi:10.1111/j.0105-1873.2005.00454.x. PMID 15701120. ↑ Oka K, Saito F, Yasuhara T, Sugimoto A (2004). "A study of cross-reactions between mango contact allergens and urushiol". Contact Dermatitis. 51 (5–6): 292–6. doi:10.1111/j.0105-1873.2004.00451.x. PMID 15606656. 1 2 McGovern TW, LaWarre S (2001). 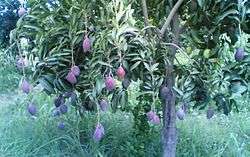 "Botanical briefs: the mango tree—Mangifera indica L.". Cutis. 67 (5): 365–6. ↑ "National Fruit". 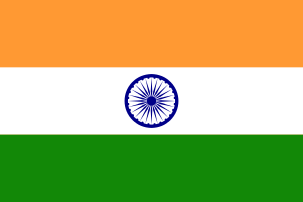 Know India. Government of India. Archived from the original on 20 August 2010. Retrieved 17 August 2010. ↑ "Mango tree, national tree". BDnews24.com. Archived from the original on 23 December 2010. Retrieved 16 November 2010. ↑ "Mango tree, national tree". bdnews24.com. ↑ Curtis Morgan (18 June 1995). "Mango has a long history as a culinary treat in India". The Milwaukee Journal. Retrieved 4 September 2013. ↑ Tiwari, M.N.P. (1989). Ambika in Jaina arts and literature, New Delhi: Bharatiya Jnanpith. ↑ Subrahmanian N, Hikosaka S, Samuel GJ (1997). Tamil social history. p. 88. Retrieved 23 March 2010. ↑ Avantika Bhuyan (7 June 2014). "Is it mango you are drinking?". Business Standard. Retrieved 19 January 2016. ↑ First tray of mangoes sells for $30,000, Australian Associated Press via The Sydney Morning Herald, 8 September 2010. ↑ "His highness, Mango maharaja: An endless obsession - Yahoo! Lifestyle India". In.lifestyle.yahoo.com. 29 May 2012. Retrieved 14 June 2013. ↑ Moore, Malcolm (7 March 2013). "How China came to worship the mango during the Cultural Revolution". Telegraph.co.uk. Additional reporting by Valentina Luo. Retrieved 28 September 2015. Ensminger, Audrey H.; et al. (1995). The Concise Encyclopedia of Foods & Nutrition. CRC Press. p. 651. ISBN 0-8493-4455-7. Litz, Richard E. (editor, 2009). The Mango: Botany, Production and Uses. 2nd edition. CABI. ISBN 978-1-84593-489-7. Susser, Allen (2001). The Great Mango Book: A Guide with Recipes. Ten Speed Press. ISBN 978-1-58008-204-4.